His name was Jerry Juran, Nathan Hertz Juran, Nathan Hertz, Nathan H. Juran or Nathan Juran. Actually this Director, Art Director, Writer and Producer was born Naftuli Hertz Juran in Gura Humorului, Bulkovina, Austria-Hungary now known as Romania on September 1, 1907. His family moved to the United States and settled in Minneapolis, Minnesota in 1912. Naftuli now known as Nathan attended the University of Minnesota where he earned a bachelor's degree in Architecture. Afterwords the young man spent a year in France at the Ecole des Beauix-Arts (School of Fine Arts) in Paris. This was followed with additional schooling at the Massachusetts Institute of Technology earning him a masters degree in Architecture. Nathan Juran was now ready to enter the business world EXCEPT the Great Depression has started and there was no work. By 1937 Nathan Hertz Juran was in Hollywood finding work in the Art Department of RKO Studios. His first credited work was as an Assistant Art Director, as Nathan Juran, on the 1941 Jack Benny comedy "Charlie's Aunt" released by 20th Century Fox. The Jack Benny feature was the first of 29 on screen credits in Art Direction covering a period from 1941 through 1952 with a break between late 1942 through 1945. At that time Juran had enlisted in the Army and was a photographer for "The Office of Strategic Services (OSS)" and would find himself being reassigned to the "Royal Air Force" intelligence service. Prior to entering the Second World War. 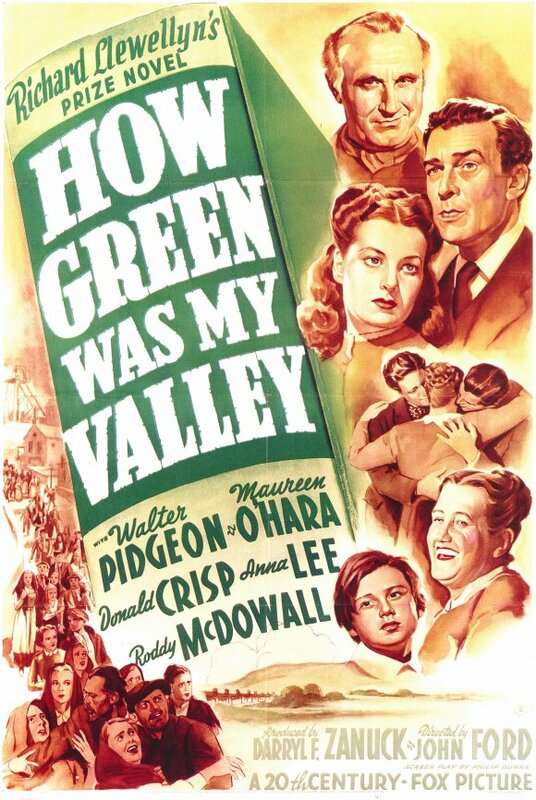 Nathan Juran along with Department Head Richard Day and Thomas Little shared the Academy Award for "Best Black and White Art Direction-Interior Decoration" for John Ford's "HOW GREEN WAS MY VALLEY". This was only his third credited motion picture work. 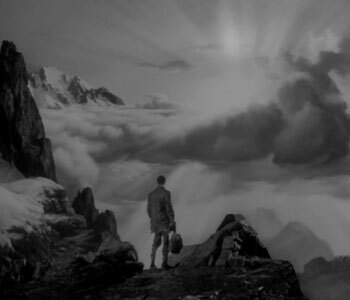 Nathan Juran's work as Art Director included the Henry Hathaway directed "Then Gentlemen from West Point" in 1942 and the horror film "Dr Renault's Secret" the same year. The 39 year old Art Director received his second Oscar nomination along with Richard Day for the motion picture "THE RAZOR'S EDGE", in 1946, starring Tyrone Power and Gene Tierney. This was Juran's first film work after the Second World War had ended. In 1948 he worked on the Joan Fontaine/Burt Lancaster film noir "Kiss the Blood Off My Hands". Followed by director Anthony Mann's "Winchester 73" starring James Stewart and the Stewart comedy about a giant invisible rabbit named "Harvey" both in 1950. !951 saw two motion pictures at opposite ends for types. The first was the musical drama "Meet Danny Wilson" starring Frank Sinatra and Shelley Winters. However, it was that second film that year that was of interested to Nathan H. Juran's fans. "THE STRANGE DOOR" starred Charles Laughton and Boris Karloff.. 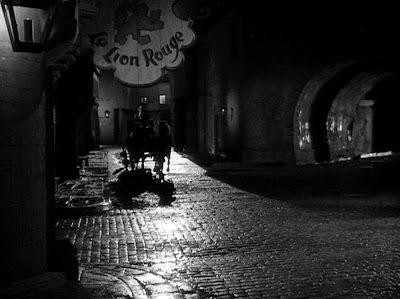 The picture is described as a film noir thriller horror film. Nathan Juran's last motion picture as Art Director was a forgotten Universal Studio's Western called "The Untamed Frontier" in Janary 1952. It starred Joseph Cotton, Shelley Winters and Scott Brady. Below Scott Brady talks to Lee Van Cleef in the picture. Also in small roles were Fess Parker and in his first movie David Janssen. 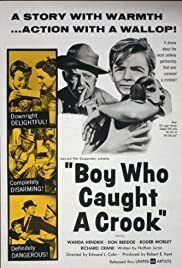 His next feature was released in December of 1952 and was the first time Nathan Juran was listed as the Director of the entire motion picture and not the Art Director. 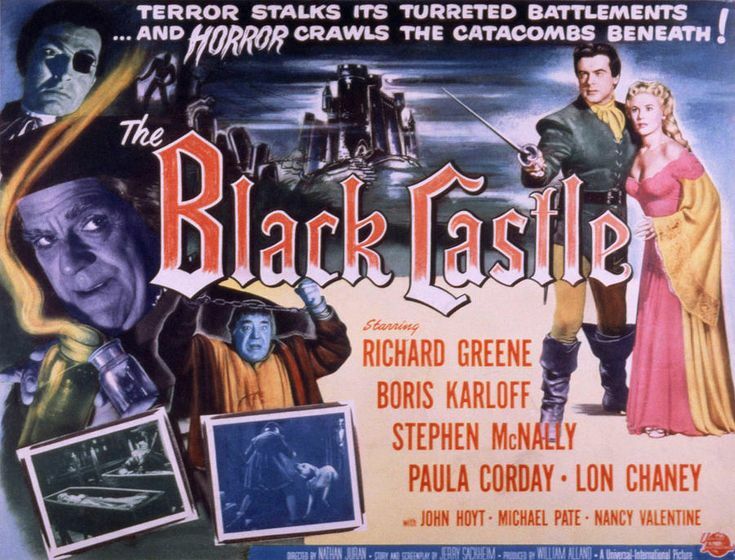 This Universal Studio's release is also described as a film noir thriller horror film and was entitled "THE BLACK CASTLE". The picture was not only Juran's first position as a director, but unknown to him in a genre that would include fantasy and science fiction. Which he would be mainly known for directing. The male leads were Richard Greene, Boris Karloff, Stephen McNally and Lon Chaney, Jr.. The film's female lead's name is very interesting to some movie fans. She was born in Switzerland as Jeanne Paule Teipo-ite--Mama Croset, but acted under the names of Paule Croset, Rita Corday and Paula Corday and had appeared with Karloff in the Val Lewton/Robert Wise "The Body Snatcher" in 1945. The plot has Sir Richard Burton using the alias of Richard Beckett. The character was portrayed by Richard Greene. 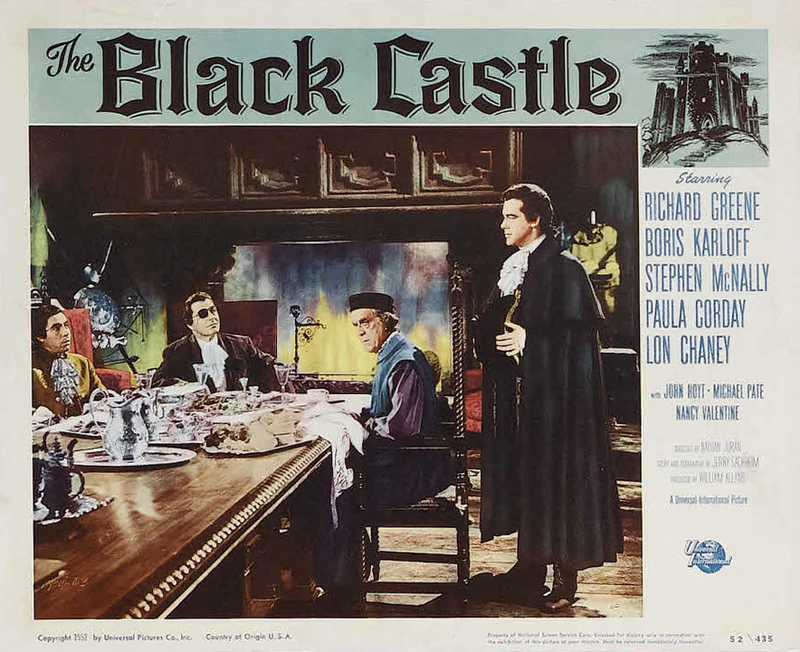 Beclett enters the castle of Count Carl von Bruno, played by Stephen McNally, to investigate the disappearance of his friends. Burton and his friends had set the local natives against the evil von Bruno when all of them were in colonial British Africa and von Bruno is out for revenge. Two westerns later, in 1953, one starring Audie Murphy and the other Ronald Reagan and Dorthy Malone. Found Nathan Juran directing a feature that borrowed its concept from the Arabian "One Thousand and One Nights" stories called "The Golden Blade". Playing the evil Vizier Jafar was George Macready. While Princess Khairuzan was Piper Laurie/ A long way from her future role as the mother in Brian DePalma's "Carrie", but being type cast as the Princess by Universal Studio's. She had appeared twice before with the equally unknown Tony Curtis in bpth "The Prince Who Was a Thief" and "Son of Ali Baba". 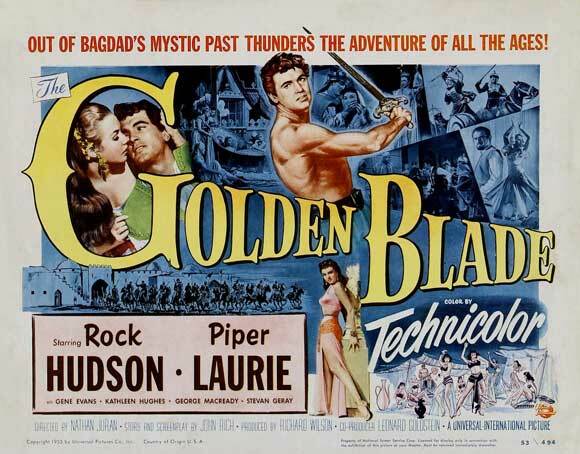 Portraying the hero of "The Golden Blade", Harun, was actor Rock Hudson. For the next three years Nathan Juran directed four more features for Universal Studios and then made his first move to directing on television. Released in 1958 was an Italian motion picture directed by Nathan Juran "Le imprese di una spada (Business of a Legendary Sword)". The following year saw the same cast in a companion Italian motion "Mantelli e spade insanguinate (Blood Cloaks and Swords)". The credits indicated it was also directed by Nathan Juran. In actuality these were made from episodes of a 1956 Italian television series based upon Alexander Dumas' "The Three Musketeers". Nathan Juran was one of five directors including Hugo Fregonese, Joseph Lerner, Frank McDonald and Mauro Bologini. However, after his last television series of the period. Nathan Juran moved to the first of a group of motion pictures he would always be connected with by fans of 1950's Science Fiction and Fantasy. 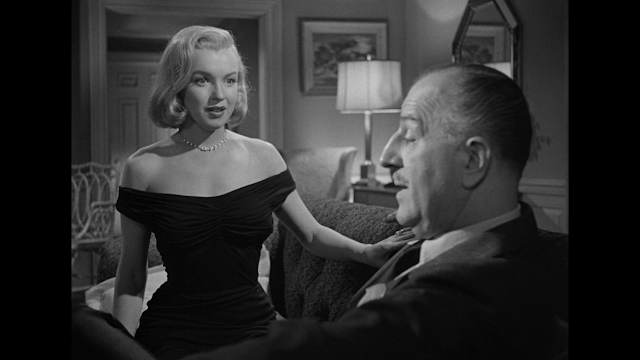 It was the first of four films he directed in 1957. Starring the future "Peter Gunn" of the Blake Edwards television series of that same name Craig Stevens and the future Paul Drake of television's "Perry Mason" William Hopper was "THE DEADLY MANTIS"
This low budget cult classic utilized plenty of U.S. Air Force stock footage to bad out the story and keep the costs down. It tells the typical monster on the loose story about a prehistoric Mantis that comes to life, because of a volcanic eruption thousands of miles away effecting the entire earth. 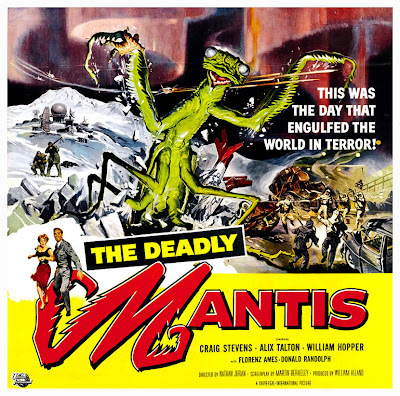 The title Mantis ends its life from chemical bombs in a Manhattan Island tunnel. I remember seeing it on a double bill with Lex Barker in "The Girl in the Kremlin". A cold war thriller about Stalin faking his death. This feature once again brought Juran in contact with actor William Hopper. He was the son of Hollywood Gossip Columnist Hedda Hopper and was born William DeWolf Hopper, Jr, The female lead was actress Joan Taylor. Taylor had already worked with Harryhausen and Schneer on "Earth vs the Flying Saucers" two years earlier. 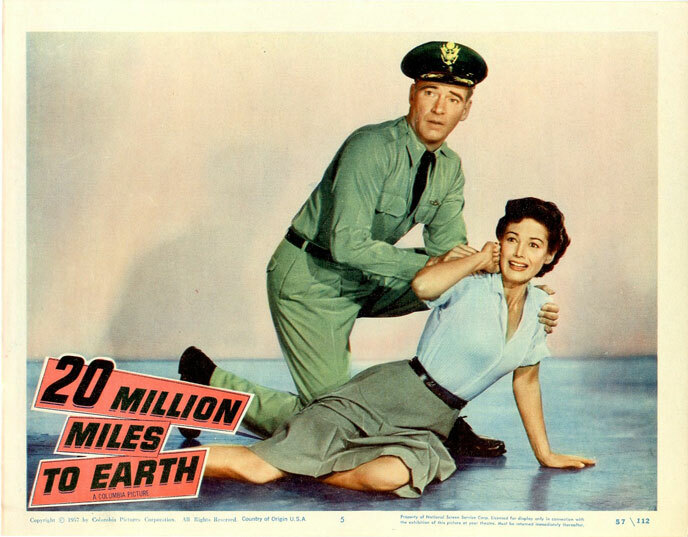 The movie was "20 MILLION MILES TO EARTH" and was about a spaceflight to the planet Venus. On its return flight to Earth the space craft crash lands off of the coast of Sicily, The crew has brought back the YMIR for Ray to bring to life on the screen. 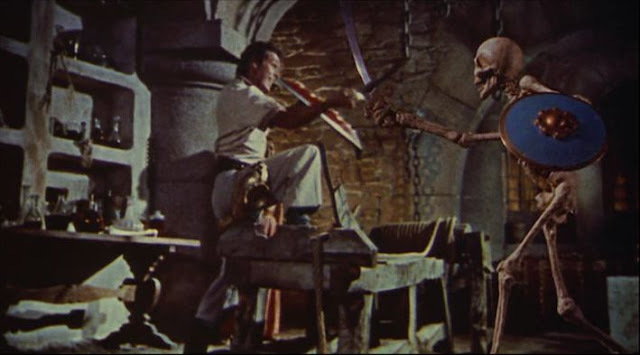 However, neither Harryhausen, or Schneer worked directly with the actors in the live sequences other than Ray explaining where to look at his creations. The two needed a good director who would understand the problems Ray faced with actor reaction and positioning. Nathan Juran with his background was just perfect and a team of three was formed at the time. The final entry for 1957 was not directed by Nathan H. Juran, or Nathan Juran. The on screen credit for the director was Nathan Hertz. The first time Nathan Juran modified his name. 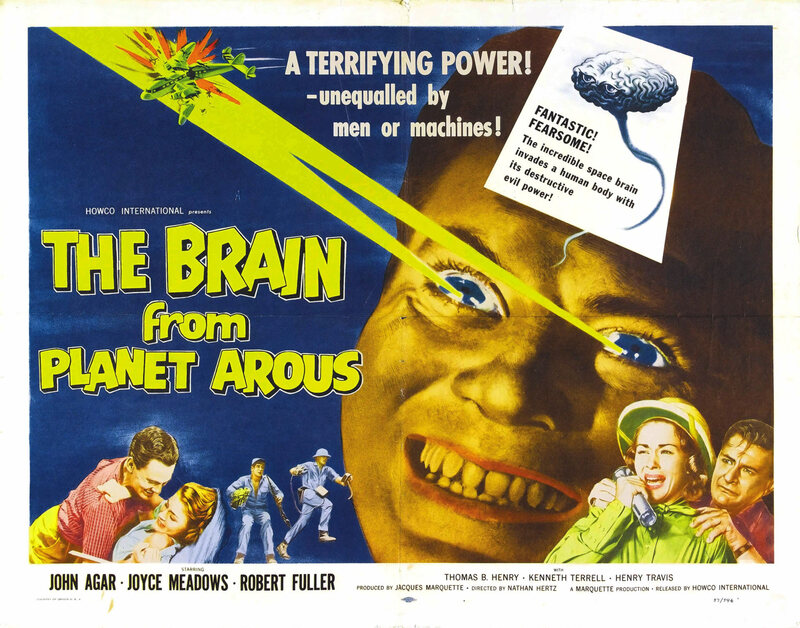 The picture starred actor John Agar in "THE BRAIN FROM PLANET AROUS". This low budgeted film is about two brains from the Planet Arous. One is an criminal, Gor, that takes over John Agar. The other is a Police Man pursuing Gor, named Vol. Vol uses Agar's girlfriend's dog as a hiding place. While scientist Agar is threatening the world the dog can get close to Gor without causing suspension. Vol needs Gor to leave John Agar's body for capture.Which the brain must do from time to time. In 1958 Nathan Hertz was back as the director of another motion picture which was even lower in budget than "The Brain from Planet Arous" and starred 50's Science Fiction/Horror actress Allison Hayes. Hayes had already been seen in both 1957's "The Unearthly" and "The Disembodied", but this picture became a cult classic she would always be remembered for playing. The picture was "THE ATTACK OF THE 50 FOOT WOMEN". The movie was written by Mark Hanna may seem to my reader like a female version of "The Amazing Colossal Man" from 1957. In that you would be right. The screenplay writer for Colossal Man, Mark Hanma, wrote the screenplay for this picture. He also wrote the screenplay for Roger Corman's "The Undead" starring Allison Hayes and Corman's original "Not of the Earth". The plot has Nancy Fowler Archer, portrayed by Hayes, as a rich socialite. Nancy catches her husband Harry Archer, William Hudson, cheating on her with Honey Parker, Yvette Vickers. Nancy gets he revenge when she encounters a gigantic space alien. 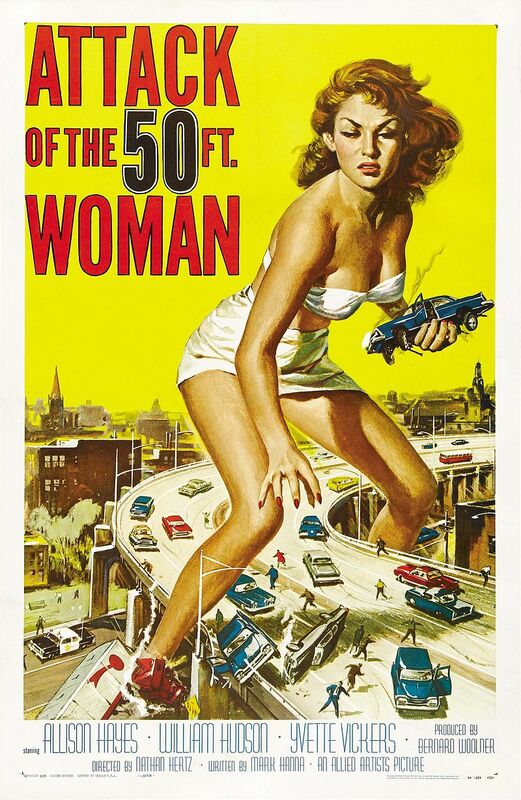 This encounter will eventually turn her into the 50 foot women of the movie's title, but not before nobody believes her story because of her known drinking problem. 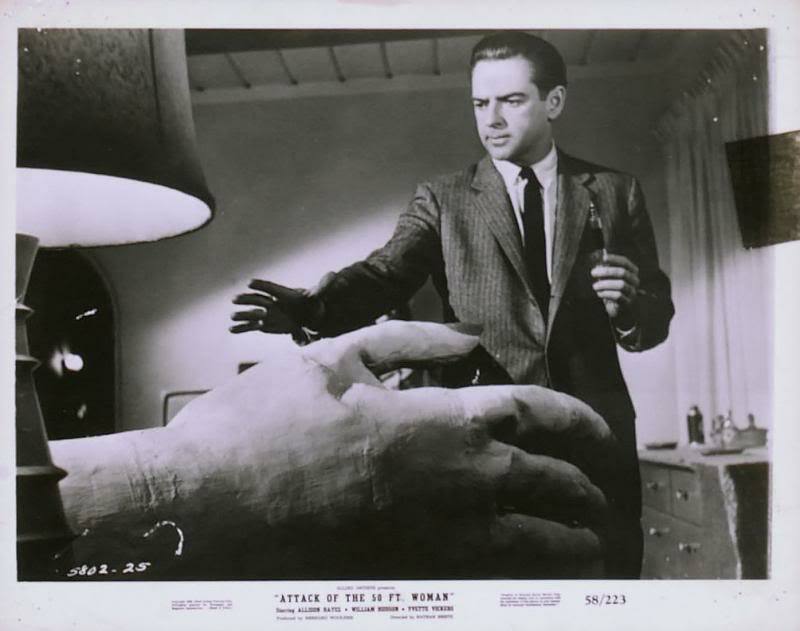 The motion picture had a budget of $89,000 dollars, How low that budget was is reflected in the following scene of Harry and Nancy's gigantic paper mache hand. However budget and critics aside. The final United States gross would be $480,000. Below Nancy rips off the roof of the hotel containing Honey and Harry. 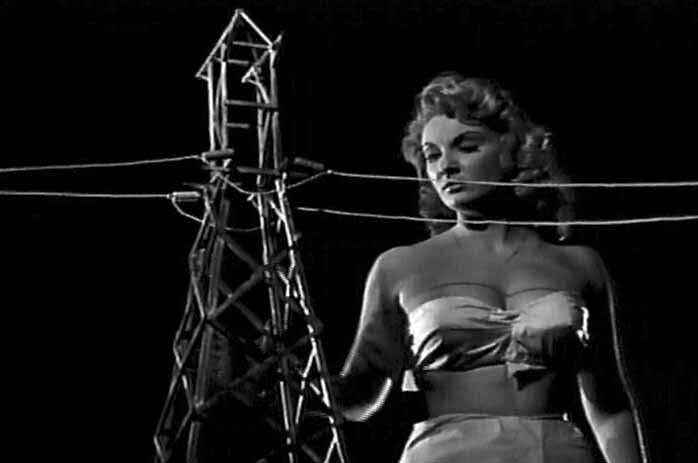 Nancy is killed when she falls into the power lines after the sheriff shoots her. 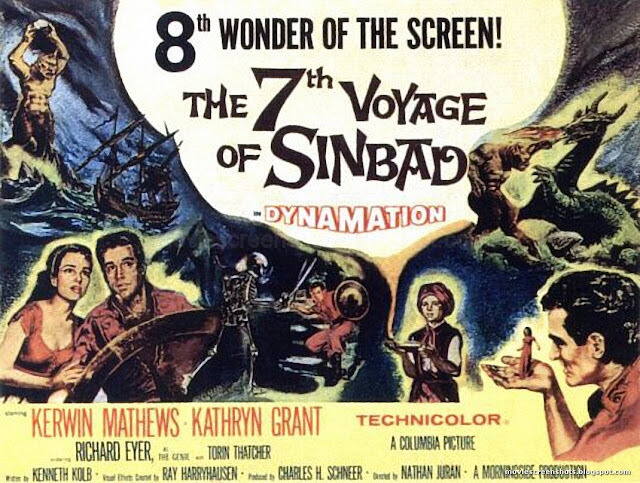 "Attack of the 50 Foot Women" may have had the name Nathan Hertz on it, but Nathan Juran was back for his last motion picture released in 1958 and his second collaboration with Ray Harryhausen and Charles H. Schneer "THE 7TH VOYAGE OF SINBAD". The budget for "The 7th Voyage of Sinbad" was $170,000 more than the total United States gross for "Attack of the 50 Foot Women". Production had started months before for Ray Harryhausen and would take a total of 11 to complete the animation sequences. This meant for Juran a larger challenge than with "20 Million Miles to Earth" with shooting the live action sequences. The previous film only involved one stop motion creature except in the elephant fight. Which just basically meant having the extras stay out of a certain area. Another problem facing the director was Ray's new process Dynamation. The film frame size was now wide screen and the picture was also in color. It was extremely critical that the actors not infringe on Harryhausen's boundaries. Ray worked hard with star Kerwin Mathews on his positioning. Above a photo from Ray Harryhausen's "An Animated Life" I took of the team working on "The 7th Voyage of Sinbad". 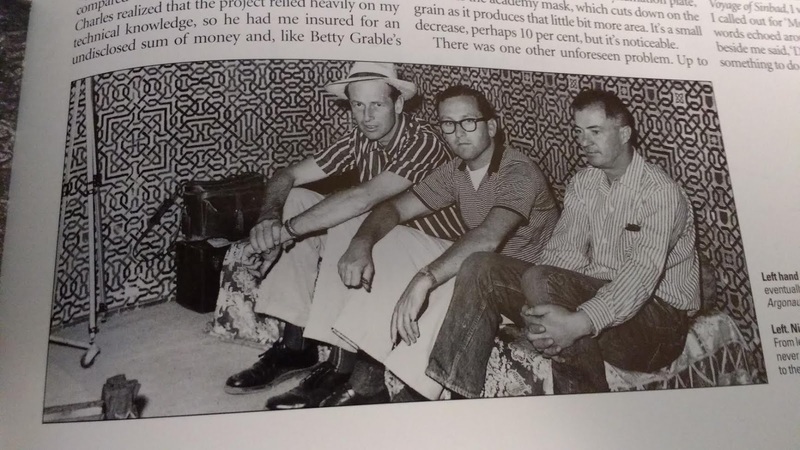 Left to Right: Harryhausen, Charles H. Schneer and Nathan Juran. The classic example of an actor not invading Ray's space, but reacting to it has Kerwin Mathews fighting the skeleton. The U.S. and Canadian initial release take for the picture was $3.2 million 1958 dollars. At the time of this writing in 2017 that would equate to just $500,000 short of $27 million dollars..
1959 through 1960 found only one new feature film for Juran, but work on two Science Fiction television series. 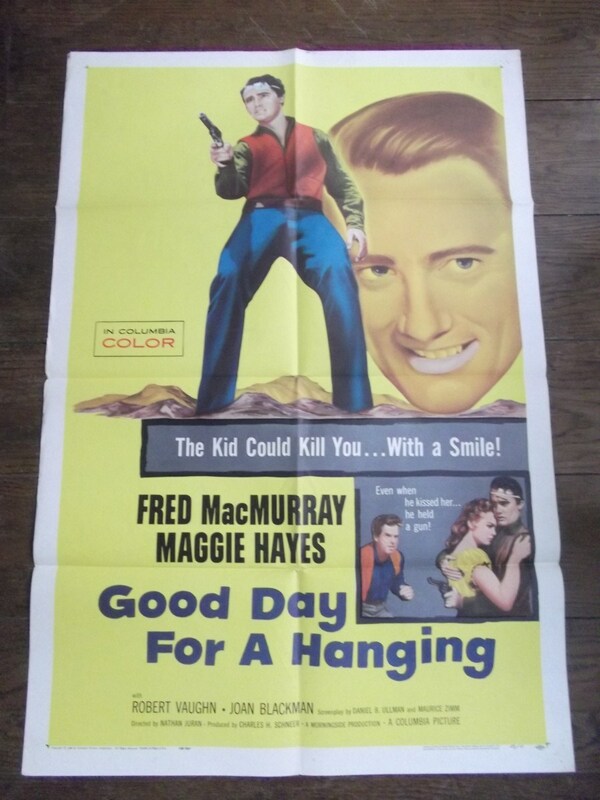 The feature was a western from Harryhausen and Schneer's "Morningside Productions" "A Good Day for a Hanging". The picture starred Fred MacMurray. but in third billing was a young actor named Robert Vaughn. Whose image is mainly depicted on the original poster for the picture. His television work included 4 episodes of "Men Into Space" starring William Lundigan, Joyce Taylor and Charles Herbert as an Air Force family in a series about the exploration of Outer Space and 4 episodes of "World of Giants" starring Marshall Thompson as a 6 inch tall American Spy working with Arthur Franz. 1961 found Jerry Juran returning to write the original story and it's screenplay for the motion picture "DR BLOOD'S COFFIN". This British film starred Kieron Moore amd Hazel Court. That work was followed by another story and screenplay, but as Nathan Juran entitled "The Boy Who Caught a Crook". This was a family film from Executive Producer Edward Small. Filmed in Puerto Rico written, produced and directed by Nathan Juran was "FLIGHT OF THE LOST BALLOON". The movie starred Marshall Thompson, Marla Powers and James Lanphier and was based upon Jules Verne's "Five Weeks in a Balloon". Although there was no mention of the French author anywhere on the posters, or in the film's titles and credits. However, there are some interesting stories related to making this motion picture and releasing it on December 28, 1961. One story mentions that Producer Irwin Allen was making his own version of Verne's "Five Weeks in a Balloon". It was said that "Flight of the Lost Balloon" Executive Producer Nathan H. Juran was attempting to beat Allen to the box office. He did by eight months as the other film wasn't released until August 22. 1962. Then there was the story that Co-Producers and Distributors Bernard and David Woolner wanted the film to be released prior to Ray Harryhausen and Charles H. Schneer's "The Mysterious Island", because both the stories where by Jules Verne and involved a balloon at one point. "The Mysterious Island" was released just six days prior to "Flight of the Lost Balloon" on December 20, 1961. A quickie rip-off of the popular AROUND THE WORLD IN 80 DAYS (1956) with a low-cost cast, this period piece features Thompson in the unflappable David Niven role. Theater patrons were advised upon entering the lobby that the wild, erratic flight of the title balloon, as depicted on the screen, might require them to consume antinausea pills. The thought was a sound one, but for reasons other than those stated by the promoters. Playing the comic villain is Lanphier, in what is basically the Cantinflas part--an acquisitive Hindu who journeys to Victorian London to persuade the directors of the Geographic Society to mount a rescue mission to save famed explorer Kennedy, a captive in a secret dungeon on the Nile River. It is all part of a diabolical plot; Lanphier is, in truth, Kennedy's captor, hoping to force him to reveal the location of Cleopatra's entombed treasures. Thompson elects to lead the rescue team, joined by Lanphier and Kennedy's fiancee, Powers. Setting out in a balloon, the intrepid adventurers are beset by peril with every gust of wind, the top-hatted Thompson meeting every challenge with phlegmatic British imperturbability. 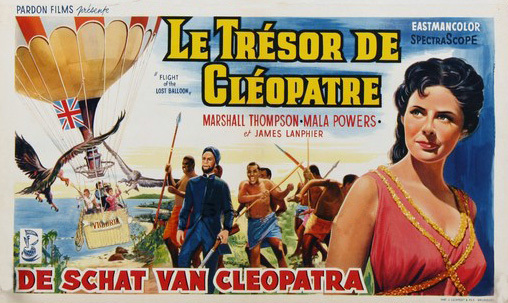 The original movie title was to have been "Cleopatra and the Cyclops". There is no actual "Cyclops" in the picture, but the treasure was "Cleopatra's". 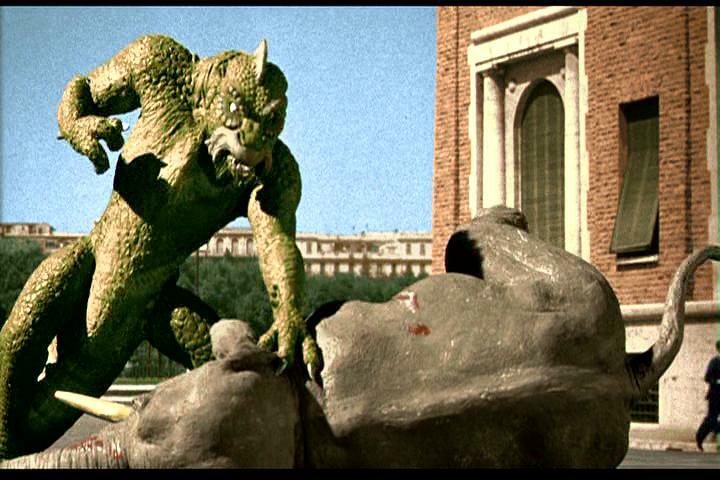 IF you're going to rip off a Ray Harryhausen film do it with style and beware of lawsuits. Producer Edward Small originally announced in 1959 he was going to make a stop motion animated feature "JACK THE GIANT KILLER", but there were delays and the picture wasn't made and released until June 13, 1962 through United Artists. The problem was it was obvious inspired by and in some sense copied from "The 7th Voyage of Sinbad". Small hired the director of the Harryhausen film Nathan H. Juran to direct and co-write the screenplay. The film starred Kerwin Mathews who had been Sinbad to play Jack. Thorin Thatcher who had been Sokurah the Magician was Pendragon. Except for the name change a basic reworking of his previous character. The stop motion special effects were by Jim Danforth who received no on screen credit. The credit went to known effects artist Augie Lohman. Danforth had worked on "Flight of the Lost Balloon", George Pal's "The Time Machine" and "Atlantis the Lost Continent" plus the Vincent Price film "Master of the World". All without on screen credit by the time he did this picture. Example of Edward Small's "Rip Off". 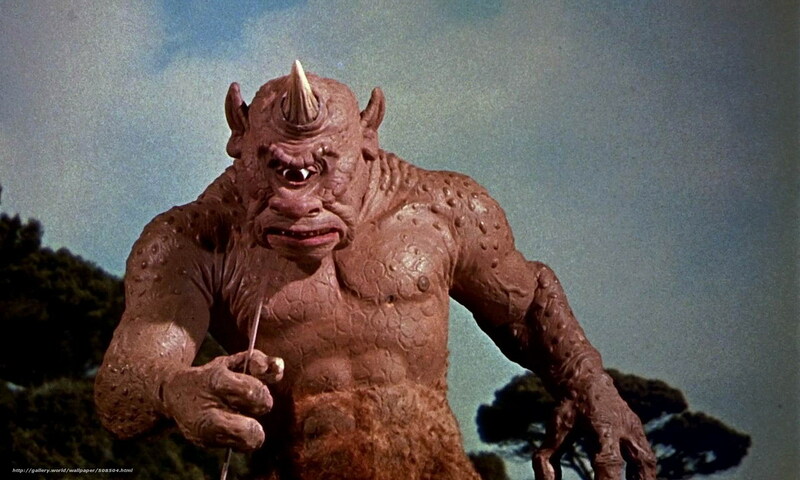 First a shot of Harryhausen's "Cyclops" and then although with two eyes. One of the giants in "Jack the Giant Killer". 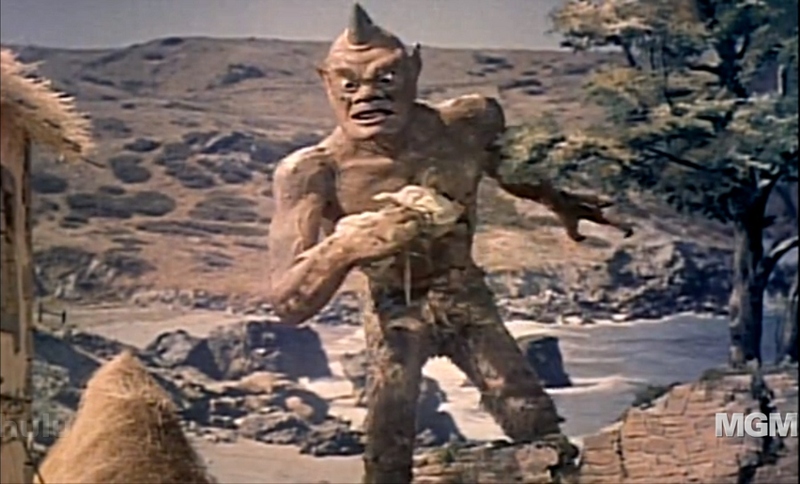 As a result of a proposed lawsuit by Columbia Studios who had released "The 7th Voyage of Sinbad" in conjunction with Harryhausen and Schneer's "Morningside Productions". Edward Small pulled the original version of "Jack the Giant Killer", which I saw when it came out, and somehow turned his picture into a Musical and re-released the movie that way. Not all of the dialogue is sung. If memory serves, there are only four or five songs in the musical version: (1) a new main title song; (2) We Have Failed Master (which DOES use sung dialogue); (3) a love song Jack sings to the Princess; and, best of all, (4) A Spectacle to See, a happy, jolly song the villain and his henchman sing while Jack fights for his life. In addition, all the leprechaun's dialogue is sung. None of this is Stephen Sondheim quality but the fact that any of it works is amazing. Torin Thatcher's new singing voice is rather good and most of the time fits his mouth well. I remember the lyrics "Jack! Jack! Jump on the monster's back!" when Kerwin Mathews leaps atop the dragon at the conclusion. I have to wonder what Nathan Juran thought of switching his film into a musical? Nathan Juran returned to England to direct the motion picture "THE SIEGE OF THE SAXONS". The picture starred the British heroine Jannett Scott of "The Day of the Triffids". Immortalized in the song "Science Fiction Double Feature" by Richard O'Brien in his "Rocky Horror Picture Show". Scott played Katherine the daughter of King Arthur. She defends Camelot against one of her father's knights planning to take over the throne. Nathan Juran returned to the team of Ray Harryhausen and Charles H. Schneer for his third and last feature film with them "THE FIRST MEN IN THE MOON". Exactly five years before Neil Armstrong stepped on the Moon's surface on July 20, 1969. Ray Harryhausen took his audience to the moon as envisioned by author H.G. Wells. The picture was initially released in the UK in July 1964. The screenplay book ended Well's origin story with what is believed, in the story, to be the first actual landing on the moon by a NATO sponsored crew in 1964. When the land they discover a British flag indicating the moon was claimed in 1899 for Queen Victoria by two men and a women. Released in the UK in August 1964 was "EAST OF SUDAN". The picture was Produced and Directed by Nathan Juran. Charles H. Schneer was the Executive Producer, but received no on screen credit. The story was set in the Sudan during the period when the Mahdi would led a Holy War against the Colonial British. The film starred Anthony Quayle and Sylvia Syms. The year after "East of Sudan" found Nathan Juran back directing television with the western series starring Robert Horton "A Man Called Shenandoah" for six episodes in 1965 and 1966. 1965 also found him directing a single episode of "Voyage to the Bottom of the Sea" followed by two more in 1966. 1966 into 1967 Nathan Juran directed 5 episodes of "The Time Tunnel" and 13 of "Lost in Space" taking him into 1968. After completing "Lost in Space" the director returned to the motion picture screen. The movie was what was then known as a "Euro Western" and was an American Western filmed in Spain and Hungary. The picture was produced by Charles H. Schneer and directed by Juran. The two stars were Telly Salvalas and George Maharis and the picture was titled "LAND RAIDERS". The motion picture would open in five other foreign countries until it arrived in January 1970 in the United States. While he had been directing "Land Raiders" in mid 1968. Nathan Juran was also directing his first episode of the television series "Land of the Giants" and all five episodes and the feature film would give Juan work into 1970. 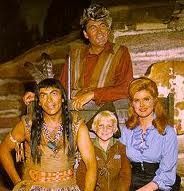 In 1964 Fess Parker returned to the television screen wearing a coonskin cap as "Daniel Boone". The show would run from 1964 into 1970 for a total of 165 episodes. Over that period Nathan Juran would direct 29 of them. Only William Wiard's 36 episodes directed more than Juran. Of the remaining 33 directors, including Fess Parker and Christian Nyby, 15 of those did one episode each and 5 did two. The remaining The remaining 14 directors average 3 to 5 each. 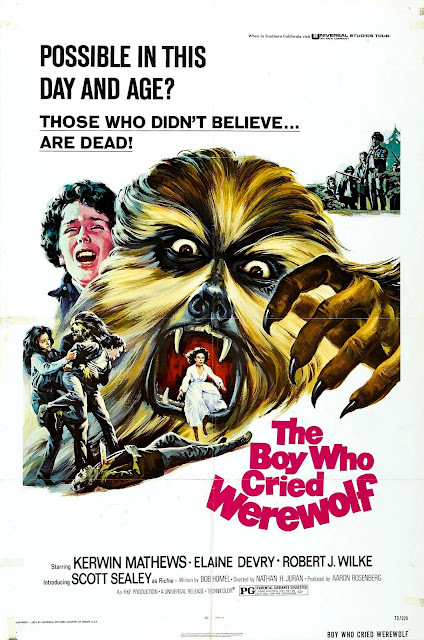 Not to be confused with the Nickelodeon 2010 made for TV film starring Victoria Justice, but with the same title as 1973's "THE BOY WHO CRIED WEREWOLF". Which was the last work of Nathan H. Juran released on November 23rd of that year. The film was produced by Aaron Rosenberg. Who to his credit are such films as James Stewart's 1950 "Winchester '73",. Both Hollywood filmed biographies "The Glenn Miller Story", 1954, and "The Benny Goodman Story" ,1956. 1955's excellent war film based on Audie Murphy's autobiography "To Hell and Back" and 1962's epic "Mutiny on the Bounty" starring Marlon Brando and Trevor Howard. Playing the father who gets bitten by a werewolf was Kerwin Mathews.The picture should have good with these three behind it, but it was very routine for a horror story. As the title implies this is updating the fable of "The Boy Who Cried Wolf" with similar results in a small town. 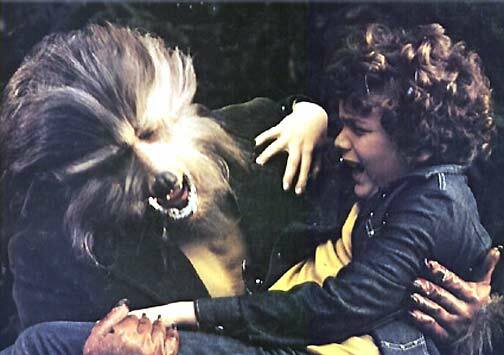 26 years after "The Boy Who Cried Werewolf" Nathan H. Juran was honored with a "Lifetime Career Award" by "The Academy of Science Fiction, Fantasy and Horror Films". On October 23, 2002 at the age of 99 he passed away at his Los Angeles County home in Palos Verdes Estates.